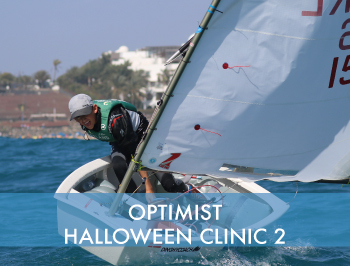 Optimist – Halloween Clinic 2 Lanzarote | Dinghycoach Weekly program 28 Oct Clinic day 1 29 Oct Clinic day 2 30 Oct Clinic day 3 31 Oct Clinic day 4 1 Nov Clinic day 5 2 Nov Clinic day 6 / Halloween Regatta day 1 / departure day Daily schedule 09.30h Physical session 10.00h Briefing 11.00h Sailing 16.30h Debriefing Pricing Option 1: Excl. Accommodation € 1.200,- excl. 7% VAT Option 2: Incl. Accommodation € 1.400,- excl. 7% VAT Accommodation Sailors get a choice to book the clinic including accommodation to stay at our hotel or excluding accommodation and arrange their accommodation in a villa through us or elsewhere by yourself. NOTE: This year Dinghycoach, Sailing Events Management S.L. & Marina Rubicon are organizing a Halloween regatta on 2,3 & 4 November 2018. Halloween Clinic 1 is the clinic prior to the regatta, Halloween Clinic II is the clinic after the regatta so we combine high level training with racing in great conditions!